Studying the hunting tactics of sea otters is difficult because wild otters stop seeking food when human divers are near. 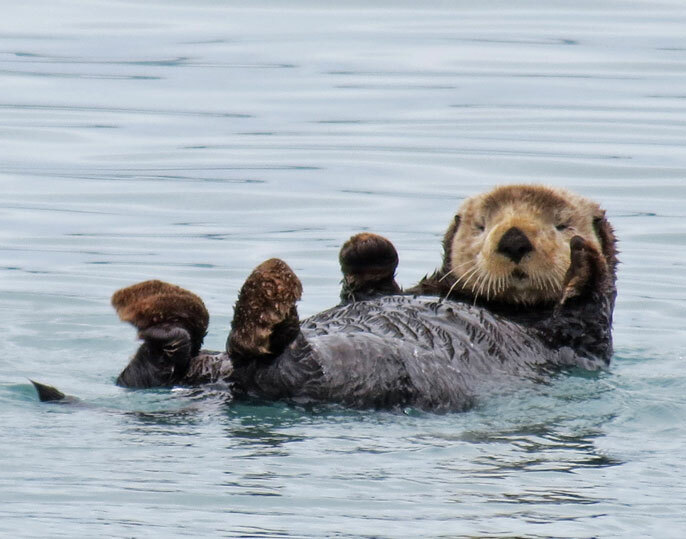 Suspecting that sea otters do not rely on smell or vision to locate dinner in the cloudy waters of Monterey Bay, researchers at UC Santa Cruz wondered whether the dexterous creatures might depend instead on the sensitivity of their whiskers and paws to hunt by touch. Selka, a young female sea otter, helped scientists at Long Marine Lab learn how sea otters use their senses to find and identify food underwater. The researchers investigated this idea with the help of a young female sea otter named Selka, a temporary resident at UC Santa Cruz's Long Marine Laboratory after multiple strandings and rehabilitation by the Monterey Bay Aquarium. The project was led by Sarah McKay Strobel, a graduate student in ecology and evolutionary biology, and Colleen Reichmuth, director of the Pinniped Cognition and Sensory Systems Laboratory. Strobel is first author of a paper on their findings, published September 17 in the Journal of Experimental Biology. Recalling the months of effort that went into preparing Selka for her starring role, she said, "Sea otters can sometimes be viewed as the 'problem child' when it comes to training." Working with a large team of volunteer helpers, Strobel, Reichmuth, and postdoctoral researcher Jillian Sills trained Selka to approach a cabinet perched on the side of her pool, in which they concealed a pair of side-by-side vertically ridged boards, one with grooves 2 millimeters wide and a second with grooves 5 millimeters wide. Inserting her paw through a narrow slot into the cabinet, Selka touched both boards, and Strobel rewarded her whenever she pressed hard on the 2-mm board to produce a click, indicating that she had identified the correct board. Graduate student Sarah McKay Strobel worked with Selka at Long Marine Lab. Selka went through multiple cycles of rescue, rehabilitation, and release before she was deemed unreleasable. She is now at the Monterey Bay Aquarium. Once Selka had mastered the first comparison, the team trained her to identify the 2-mm grooves when offered a choice between that and 4-mm grooves, eventually completing seven more comparisons with progressively narrower grooves. The researchers also taught Selka to interrogate the boards with her whiskers, although Strobel admits that training her to wear a blindfold while nuzzling the boards was tricky. "I knew that if I tried to do anything Selka wasn't ready for, I would very likely get bit. I had to make wearing the blindfold fun," Strobel said. Having completed the training process in the air, the team then raised the water level in Selka's pool to inundate the cabinet and trained her to differentiate between the submerged boards. After months of training, the team tested Selka's ability to distinguish the 2-mm grooved board from boards with grooves ranging from 2.1 to 3 millimeters wide. Tapping the pairs of boards with her paw, Selka seemed to recognize the 2-mm-wide ridges almost instantly if she encountered them first, depressing the board swiftly to make a click, but moved on quickly to the second board if the grooves were the wrong width. Strobel said she was amazed by Selka's decisiveness, taking less than 0.2 seconds when using her paw and 0.4 seconds when exploring with her whiskers. In contrast, human volunteers who explored the boards with their fingertips were 30 times slower. It made no difference to Selka whether the boards were submerged or in the air. Coauthor Tim Tinker used a novel statistical method to compare the change in Selka's accuracy as the difference between the grooves became narrower. He found that she could distinguish grooves that were 0.26 millimeters wider than the 2-mm groove with her paw, although her accuracy declined slightly when using her whiskers. Sea otters consume prodigious amounts of prey, equal to about 25 percent of their own body weight every day. "They are eating machines," said Strobel, who suspects that the ability to make rapid decisions based on touch is essential for sea otters' survival. "Selka used her memory to solve the trial as quickly as possible," she said. "Their dives tend to be one to two minutes or shorter, which means they have to be very efficient. Our results suggest that sea otters are capable of using touch in this short amount of time to detect prey."